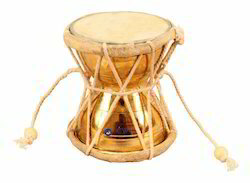 CwC Brass Damaru/Pellet Drum made same as was in ancient times with original Damaru sound in 100% working condition.Our Brass items have antique designs. The item is highly durable, elegant and a wonderful addition to your Home Decor. We are the leading and prominent Manufacturer and Supplier of Hunting Calling Bugles. Rana Overseas leading Manufacturer and Exporter of Brass Horns, We have wide range in Brass Horns and in different sizes. These Brass instruments are also called labrosones, literally meaning "lip-vibrated instruments"
we are Manufacturing, Wholesaling and Trading a premium quality range of Brass Musical Instruments. We are a reputed Manufacturer and Exporter of Brass Horns. These Brass Horns have corrosion resistant and durable brass structure. Brass Horns are provided with rubber casing, which produces clear and high volume sound. Our valued clients can avail Brass Horns in variety of designs as per their requirement. This handcrafted Brass Bugle is a real and usable bugle made of pure brass. The size of the bugle is approx. 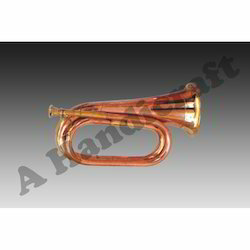 We are one of the chief Exporters and Suppliers of Brass Bugle that is manufactured using the finest grade brass. Our Brass Bugle is appreciated in the domestic and international markets for their aesthetic appearance and durability. We check our Brass Bugles before their delivery to the customers to ensure that they are flawless. They are offered in prices as per the quantity ordered. We are a leading manufacturer of full range of Brass Musical Instruments. available in different sizes and different designs with carved symbols. This Handcrafted product is a real and usable Bugle made of pure brass. You can really play upon the instrument. - Designed for classical and steel-string guitars. - Finely handcrafted from curly maple or figured walnut (see below for specific wood prices). Other wood options may be possible; please inquire for details. Customers can avail from us a classical range of Bugles. These have a heavy copper body, which has the optimum tonal qualities required in this instrument. Bugles are the simplest brass instruments and can usually be seen in military camps for indicating schedules and routine activities.